Photo: Alex Indigo. Creative Commons BY (cropped). 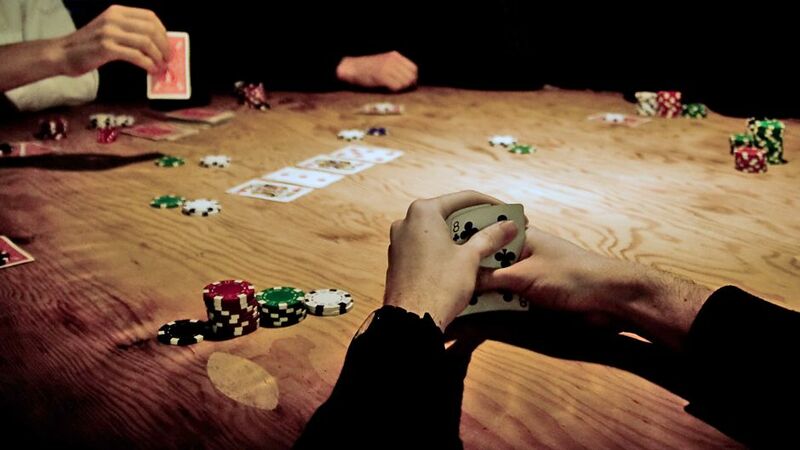 In the grand poker game of geopolitics, energy is often the wild card. That’s why the Middle East is such a mess: Great Powers (first Britain, more recently the United States) have been installing, propping up, toppling, threatening, or bribing regimes in that region — almost always to the detriment of indigenous populations — ever since the first oil discovery there prior to World War I. Oil and natural gas interests are clearly implicated in current turmoil in or around Libya, Iraq, Syria and Iran — and also Ukraine. In each instance it requires some historical context to understand the peculiarities of the situation; let’s focus for a moment on the last of these countries. Ukraine has long been a transit route for Russian gas destined for Europe. The fact that Russia is an energy superpower is frustrating to anglo-American geopolitical strategists, who see Eurasia as the key square on the “grand chessboard” (to use Zbigniew Brzezinski’s phrase) for maintaining global dominance. Hence their strategy of hemming Russia’s western flank with NATO bases, and their more recent tactic of subverting the constitutional (although thoroughly corrupt) Ukrainian government of Viktor Yanukovych (via injections of CIA cash to foment violent demonstrations) and immediately legitimizing the coup that overthrew him. Washington evidently would like either to control or to destabilize and weaken Russia; this, after all, is the way the West has dealt for decades with energy exporters in the Middle East. If Moscow won’t be the next Riyadh or Kuwait City, then let it become the next Tehran. This strategy makes many people in Europe nervous: they don’t much like dependency on Russia for energy imports, but they positively dread the prospect of being somehow cut off from needed supplies of natural gas. This is clearly a dangerous game. Russia still has a formidable nuclear arsenal and Europe’s economy is too important to toy with. However, American geopolitical strategists evidently think they have grounds for strategic boldness. In the last few years, the United States has begun hinting broadly that Europeans have nothing to fear from joining enthusiastically in an anti-Russia campaign: if push comes to shove, America could fill pipelines extending all the way from Bulgaria to Ireland with natural gas originating in the fracked shales of Pennsylvania, Texas, Oklahoma, and Louisiana. Indeed, there’s supposedly so much of the stuff that customers in Japan and South Korea might as well start preparing to luxuriate in liquefied natural gas (LNG) from the good ol’ USA, too. There’s just one flaw in this plan: there probably isn’t and won’t be enough natural gas to enable US exports of any significant magnitude. And certainly not enough oil. On the surface, there seems to be evidence to support the claim of resource abundance. According to projections from The Energy Information Administration (EIA), the statistical arm of the United States Department of Energy, shale gas production in 2040 will be 40 percent higher than it is currently, while tight oil production will declined only moderately from its current 4 million barrels per day to 3.2 million barrels per day. However, these projections are disputed by many veteran analysts, notably including a prestigious team of geoscientists from the University of Texas, independent petroleum geologist Art Berman, and David Hughes, who is associated with my organization, Post Carbon Institute, and has spent most of his career studying the energy resources of Canada. These skeptics point out that shale gas and tight oil wells typically decline rapidly (with production dropping roughly 70 percent in the first year), and that production tends to be profitable only within core areas (“sweet spots”) within much larger fuel-bearing geological formations. As these sweet spots are drilled out, each “play” will enter production decline (as has already occurred in the Haynesville and Barnett shale gas regions). Further, horizontal drilling and hydrofracturing — techniques used to wring oil and gas from shale and tight reservoirs — are expensive, so oil and gas prices need to be at historically high levels to justify them. During the last decade, the depletion of conventional oil and gas in North America and elsewhere around the world forced oil and gas prices up to economy-crushing levels. With a barrel of crude selling for $100 or so, the application of extreme extraction technologies to produce oil from low-quality reservoirs began to make sense. But the business also entailed a lot of risk and required staggering levels of debt. Historically rock-bottom-low interest rates plus boatloads of hype made it possible for small, risk-friendly companies to raise the needed capital. One of the biggest risks of this business model was that oil prices would fall, which is exactly what has happened during the past six months. Despite all the recent talk of “cheap oil,” current prices (at about $50 a barrel) actually align with the long-term inflation-adjusted historic average — but that’s too low a price to make fracking for tight oil profitable, and drilling rigs are falling idle. The oil price collapse has also wrecked prospects for profits from American LNG exports. In much of the world, natural gas prices are tied to oil prices. When oil prices were stratospheric, gas prices in Europe and Asia were so high, relative to North American prices, that spending money on building export terminals and tankers, and on cooling and pressurizing trillions of cubic feet of methane, seemed to make economic sense. Now that world oil prices have fallen by half, the difference between US and rest-of-world gas prices is not large enough to justify such investments. 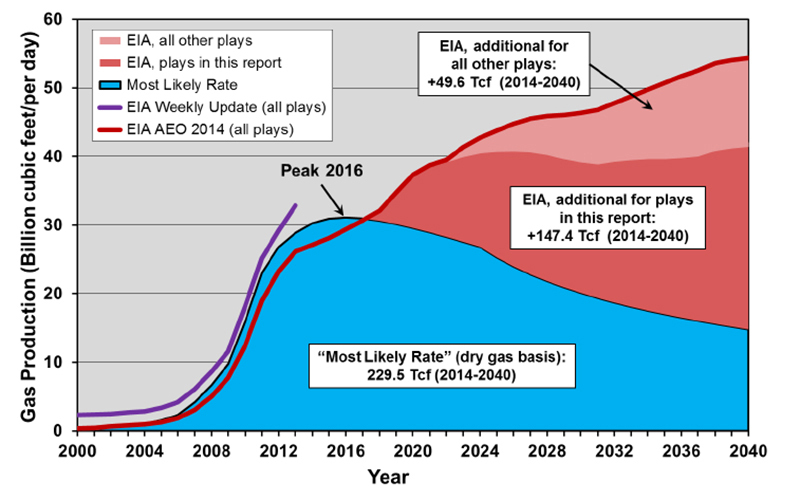 Most likely drilling rate gas production from major shale plays through 2040 compared to EIA shale gas forecast. Source: Drilling Deeper. While the EIA sees US shale gas production growing through 2040, Hughes forecasts: “Production from these plays peaks in 2016 at nearly 34 Bcf/d and declines to below 16 Bcf/d by 2040, or [by] more than 50%.” This is an enormous difference: if the EIA estimate is accurate, there is indeed the possibility of gas exports — though that would require the oil/gas price differential to increase; and even then there would not be nearly enough gas to supply all of Europe’s needs, in addition to those of American customers. But if Hughes is right, natural gas exports are laughably unlikely and the United States is probably headed into a gas supply crisis in the next decade. Hughes sees US tight oil production rates topping out around the same time as those of shale gas (ie, before 2020), and declining much further and faster than the EIA estimates. 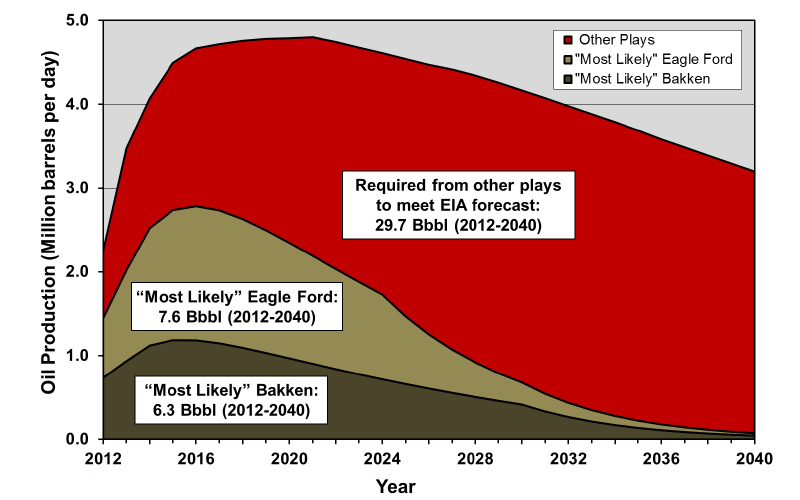 Most likely scenario projections of oil production for the Bakken and Eagle Ford plays with the remaining amount of production that would be required from other plays to meet the EIA’s total reference case forecast. Source: Drilling Deeper. Why should we believe David Hughes rather than the EIA? Read his report for yourself: it’s thorough, transparent, and logical — something that cannot be said for the forecasts in the EIA’s latest Annual Energy Outlook. And while EIA has been wrong in its production forecasts more often than it has been right, Hughes is building an impressive track record. In 2011, the EIA published a report estimating the size of the oil reserves in California’s Monterey shale basin at over 15 billion barrels; surely high rates of production would soon boost the Golden State’s economy. With help from PCI, Hughes prepared a thorough geological review of the basin and concluded that the EIA estimate was dramatically overstated. The EIA subsequently downgraded its estimate by 96 percent, to 0.6 billion barrels. And the promised Monterey shale production boom has not materialized. Even normally insightful energy commentator Michael Klare seems to have bought into to the new narrative of US resource abundance. In a recent article he critiques Republican plans to create “a North American power bloc capable of aggressively taking on Russia, China, and other foreign challengers” and implicitly accepts that it is physically possible for such plans to work. It would have been useful to his argument against US energy imperialism and continued fossil-fuel energy dominance to point to evidence that North America simply doesn’t have sufficient resources to support oil or gas exports, but nowhere does he hint at this. Commentators and politicians believe the EIA because they assume it is the highest authority on the matter. That’s understandable. But do the current policy makers in Washington — in the State Department, Pentagon, and CIA — also privately stand behind official production forecasts? Or is all the talk about the US using oil and gas exports to neutralize Russia’s influence just a bluff? If they do believe their own talking points, they have embarked on a game they cannot win by making promises they probably cannot even begin to fulfill. If they don’t believe the hype — that is, if this is all a bluff — then it is a deeply cynical strategy (in the very worst sense of the word). Instead of helping prepare America, Europe, and the rest of the world for an inevitable post-hydrocarbon future, these policymakers are using exaggerated resource estimates merely to score points in a game, while the global arena in which that game is being played is about to be engulfed by economic and ecological catastrophe. My guess is that the Washington power brokers really believe what they are saying. The level of energy literacy among policymakers is abysmal. And with the EIA feeding them misinformation, what else are they to do but try to use it to their advantage? After all, the message of resource abundance is what they want to hear and believe. This is how empires crash: the folks in charge pay their information ministries to come up with only good news; rulers act on the basis of unrealistic assumptions; reality bites; and when it does, no one is prepared. The evidence suggests the United States is playing energy poker with a pair of jacks in its hand, but betting as if it had four aces. Washington can only hope the rest of the world is populated with terrible and unlucky poker players; otherwise, this game could end in bitter feelings at best, gunfire at worst.